Sanctions by the United States, it seems, have hit World of Warcraft. WikimediaIranian gamers took to the World of Warcraft message board…complaining that they had been shut out of the online game. “Well, as if life of an Iranian couldn’t get worse, the Battle.net became completely inaccessible as of today,” one World of Warcraft fan wrote in frustration. The year’s salvo of US and international sanctions, aimed at choking off Tehran’s controversial nuclear program, have throttled the Iranian economy (see: plummeting oil exports), ravaging major industries like transportation and emergency civilian health care along the way. The online role-playing game is merely the latest casualty in this drawn-out geopolitical fight. 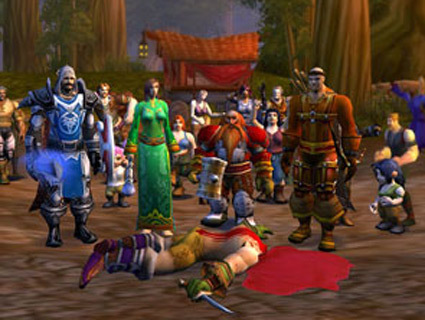 Blizzard Entertainment, the California-based video game developers who debuted the WoW series in 2004, recently explained that the Iranian gamer black-out was required to stay in compliance with US law. “We apologize for any inconvenience this causes and will happily lift these restrictions as soon as U.S. law allows,” one employee wrote. The World of Warcraft universe includes roughly 9.1 million subscribers worldwide, an 11-percent drop from 10.2 million in March 2012. The game also holds the 2009 Guinness World Record for the most popular multiplayer role-playing game. There have also been numerous studies on the severity of video game addiction, with some rating World of Warcraft as addicting as cocaine. Pity the Iranians going through withdrawl.